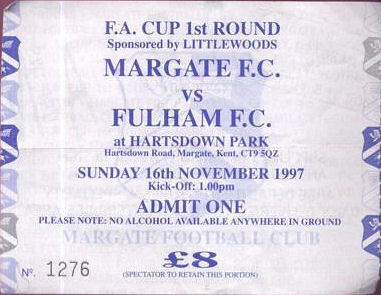 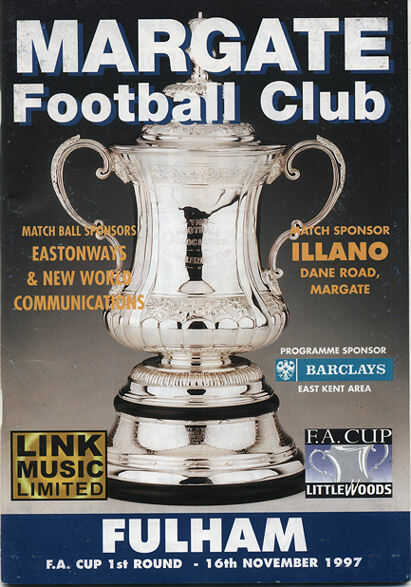 25 years after the club's last appearance in the First Round Proper of the FA Cup Margate were drawn to play Division Two (now League One) club Fulham at Hartsdown Park. 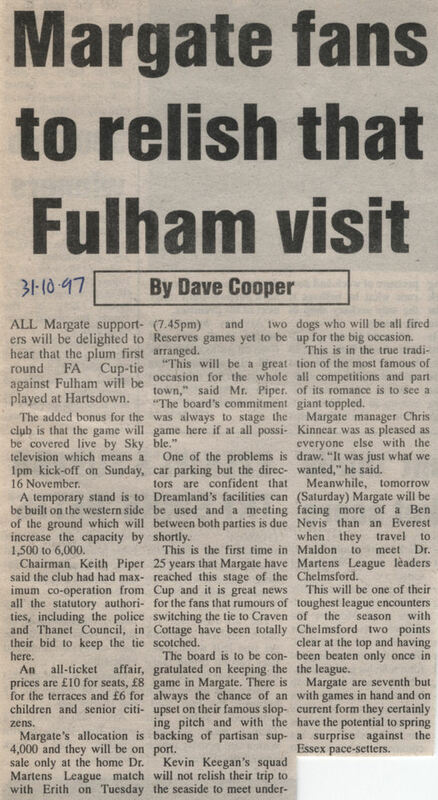 The Cottagers had recently been taken over by Harrods boss Mohammed Al Fayed and new managerial team Kevin Keegan and Ray Wilkins had spent heavily rebuilding the Fulham side. 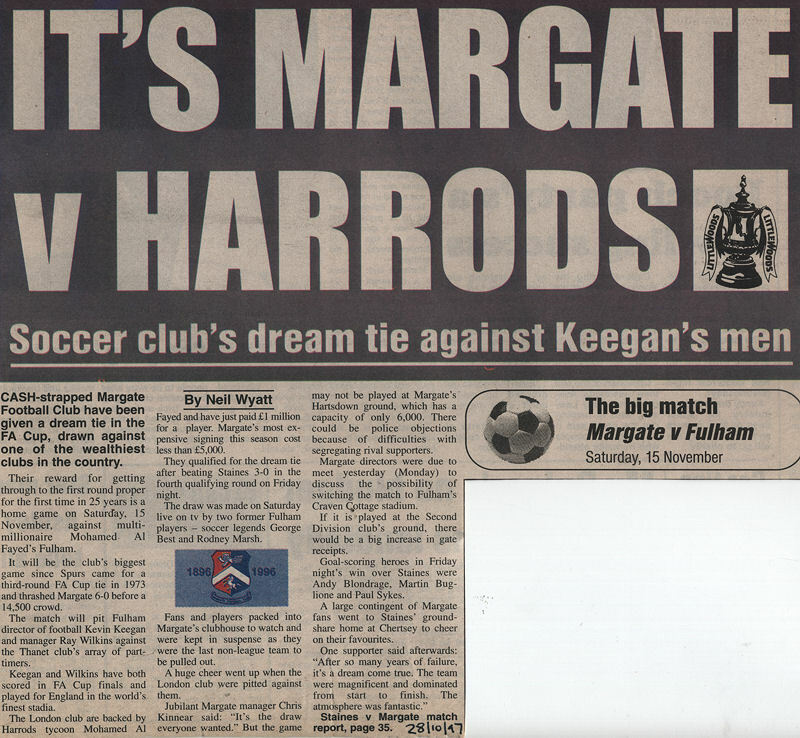 It was the plum draw for Margate and the tie attracted Sky's cameras with the match being shown live by the satellite broadcaster after it was switched from Saturday to Sunday. 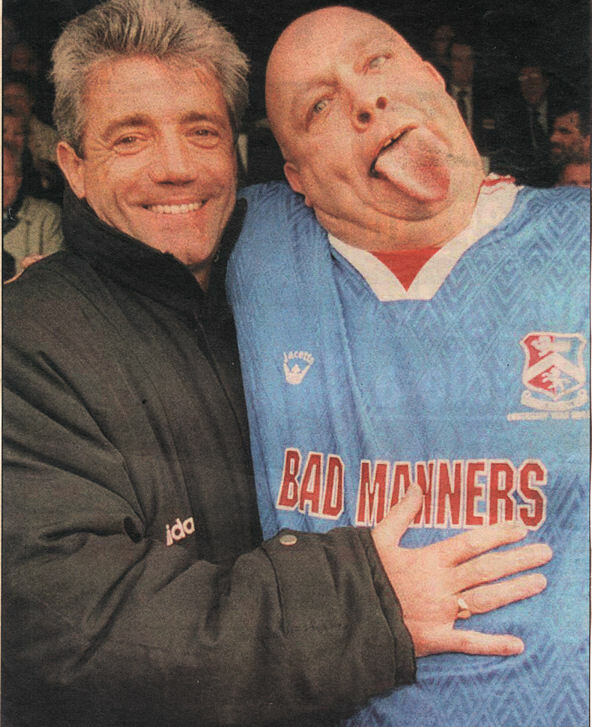 Pre-match publicity saw Bad Manners frontman Buster Bloodvessel heavily, in every sense, involved and even resulted in an album being hastily put together by Link Music, Margate's sponsors at the time. 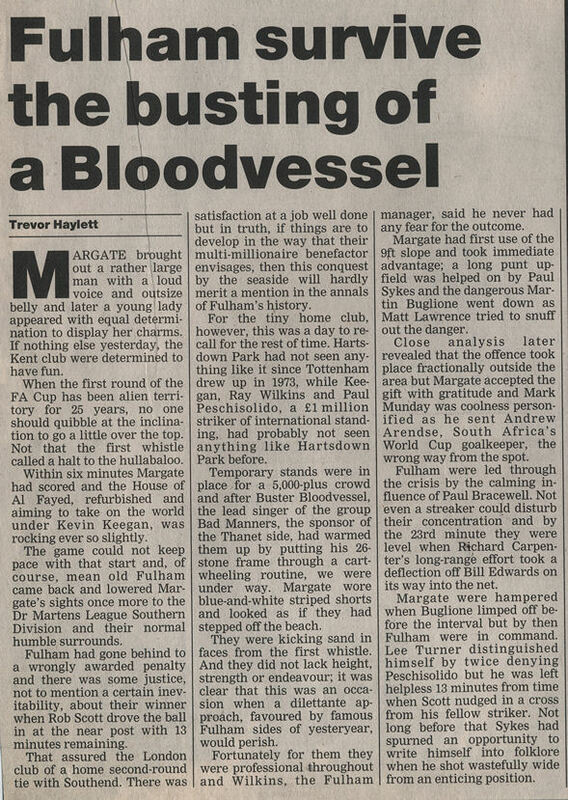 A capacity crowd of 5,100 saw the game, some from two temporary stands erected opposite the old main stand, and a Mark Munday penalty gave Margate an early lead. 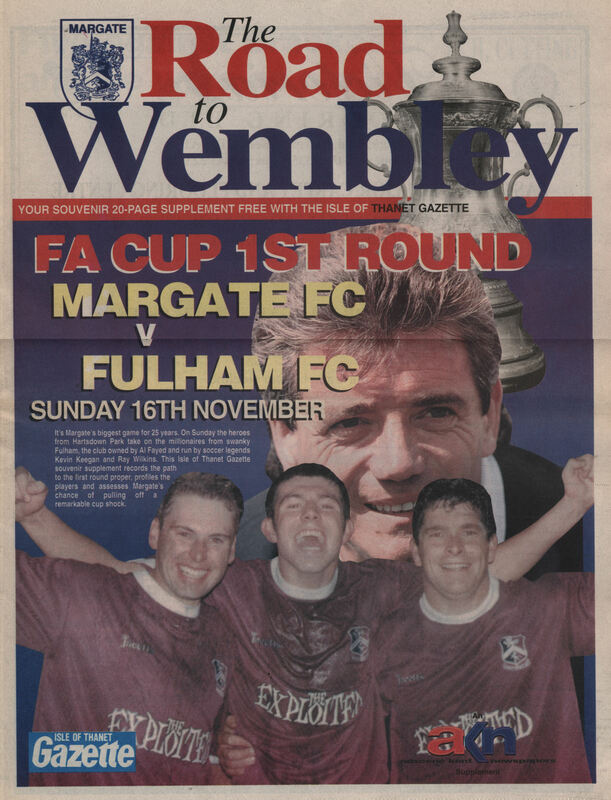 A cruel deflection saw Fulham equalise later in the first half and the Londoners won the tie with a second half goal although Margate's Paul Sykes had a golden chance to equalise with time running out. 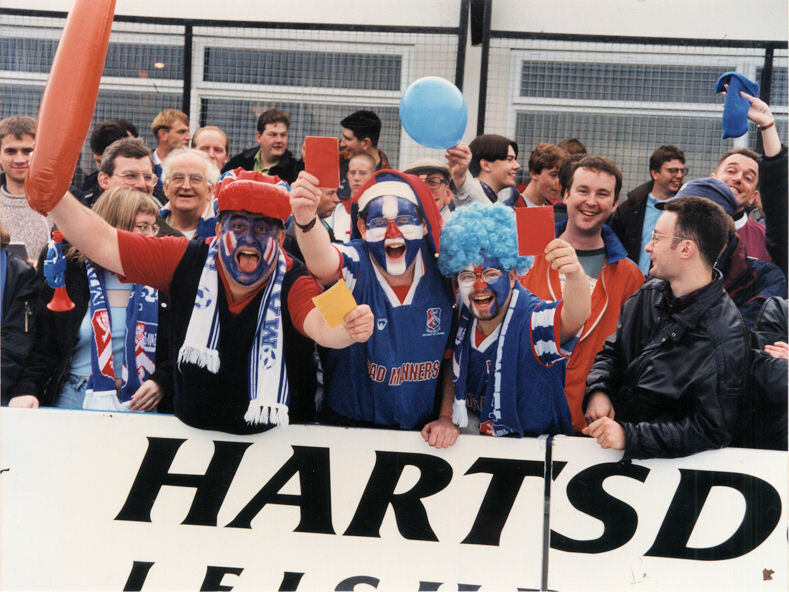 PRE-MATCH PHOTOS Above: Margate players and officials. 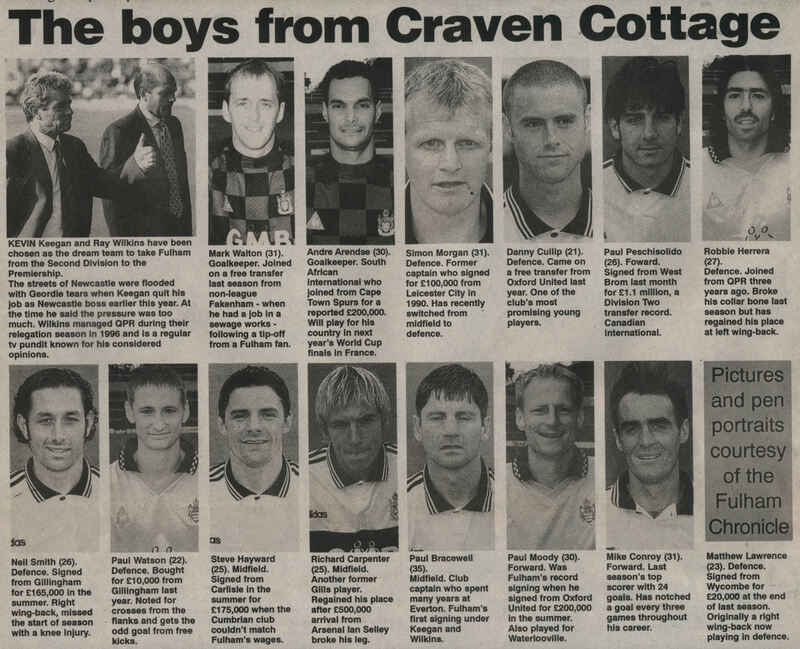 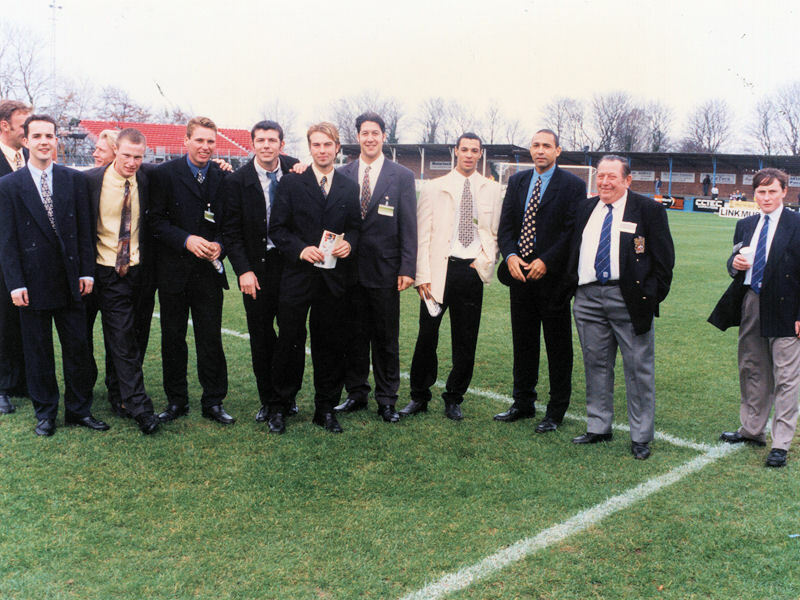 Left to right - Lee Turner (partially hidden), Eliot Martin, Phil Handford (partially hidden), David Cory, Martin Buglione, Paul Sykes, Lee Spiller, Karl Emerick, Danny Wilson, Tony Dixon, Ron Hewitt (club official) and Steve Winch (reserve team manager). 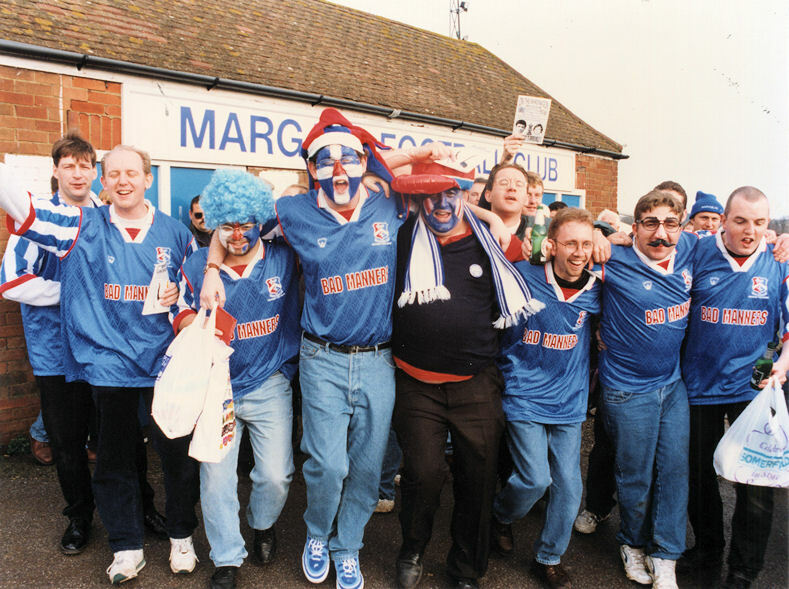 Above: Supporters outside Hartsdown Park with a copy of the 'On The Bandwagon' fanzine being held aloft. 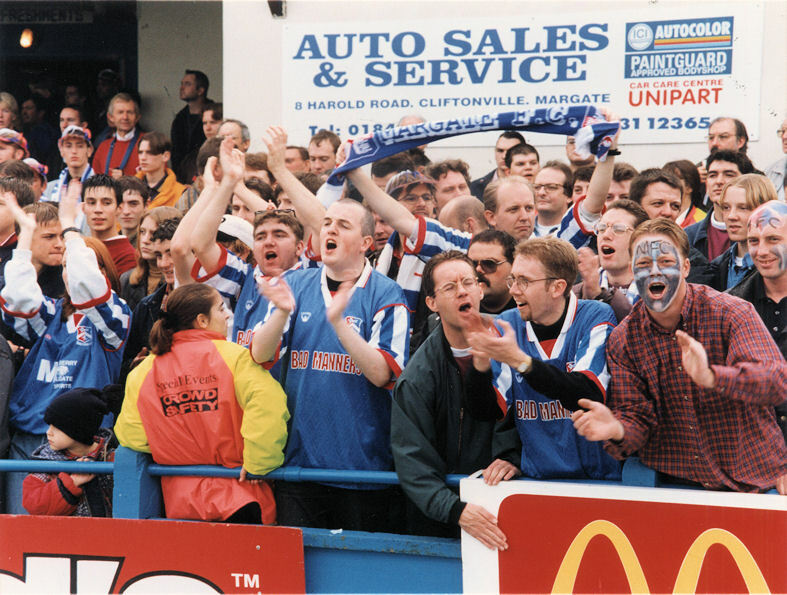 Above: Supporters at the Hartsdown Road end. 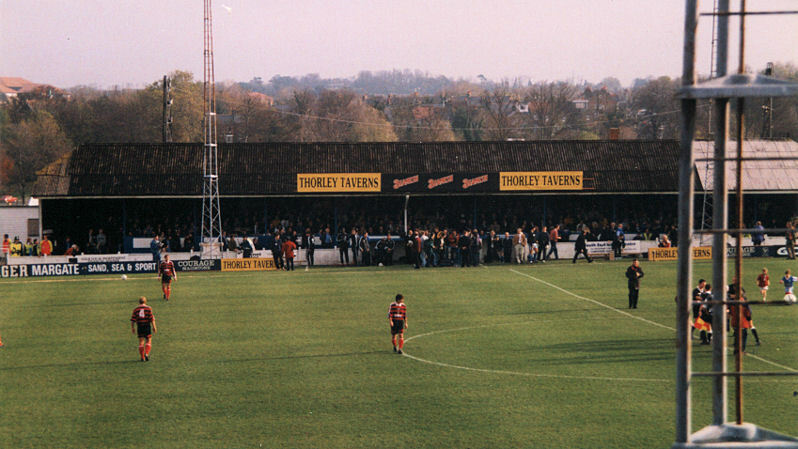 Above: Another crowd photo from the Hartsdown Road end. 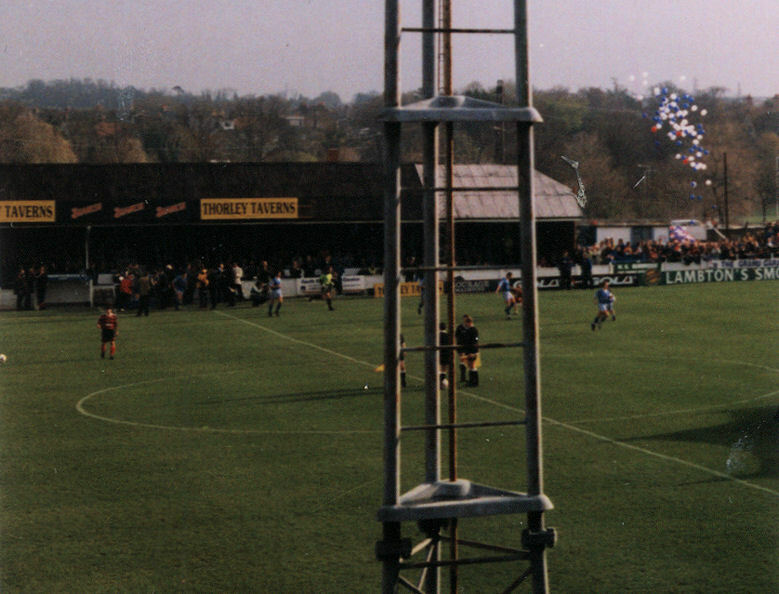 Above: Alan Kay photo showing the tv crane rising above Hartsdown Park. 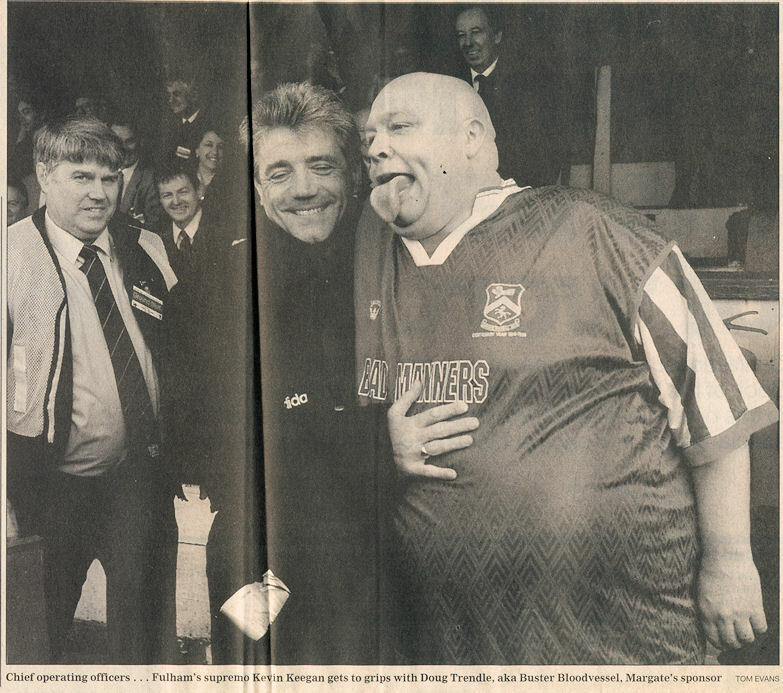 Above: Four photos showing the meeting of Kevin Keegan and Buster Bloodvessel. 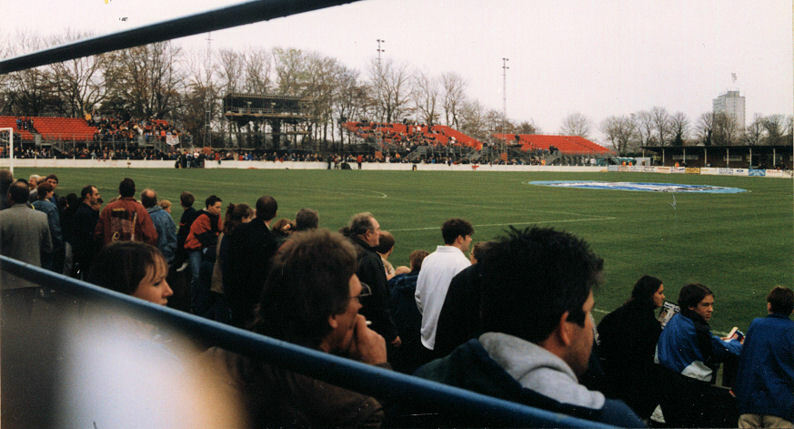 Above: Alan Kay photo showing the temporary stands (orange seats) at Hartsdown Park. 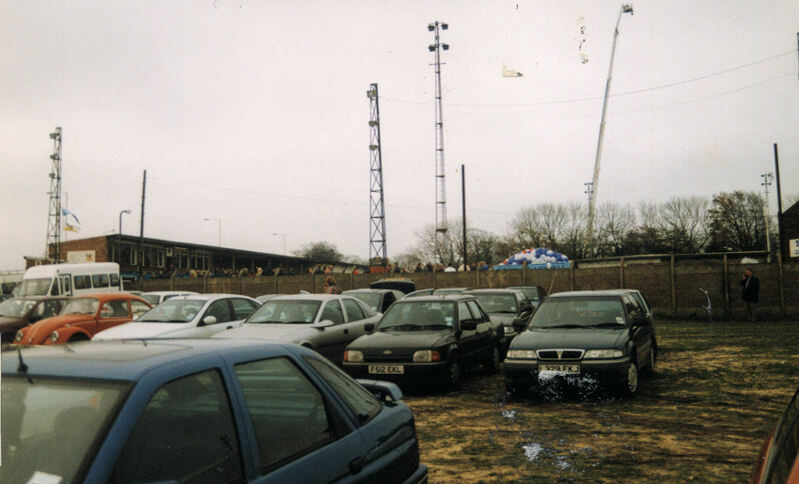 Above: Another Alan Kay photo capturing the pre-match scene. 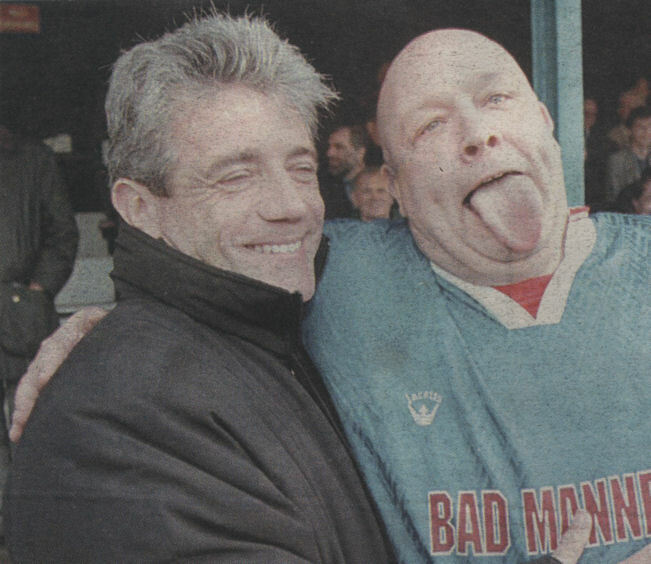 Above: Alan Kay photo showing Buster Bloodvessel on the pitch. 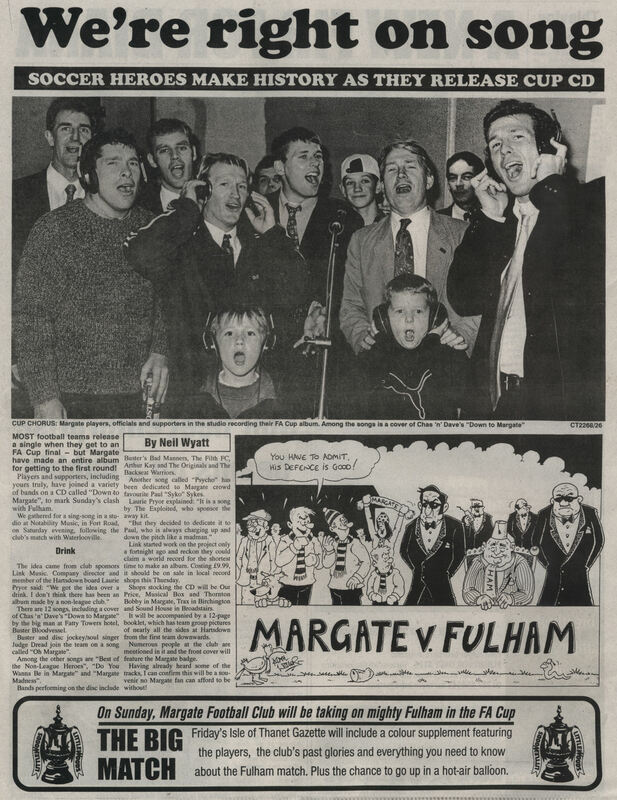 Above: Alan Kay photo of the Fulham squad warming up. 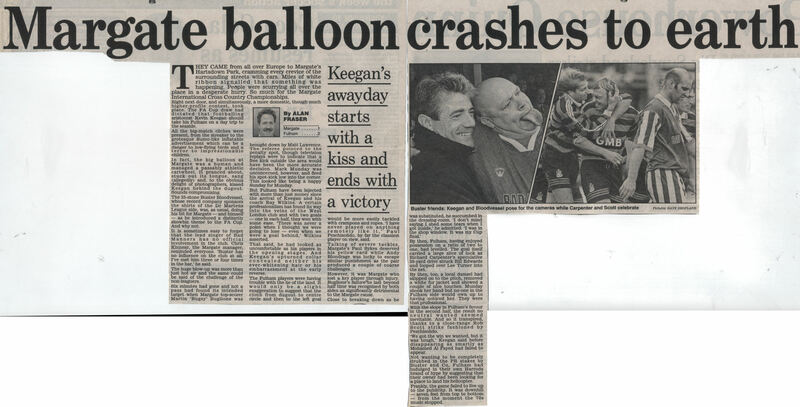 Above: Alan Kay photo showing the teams running out. 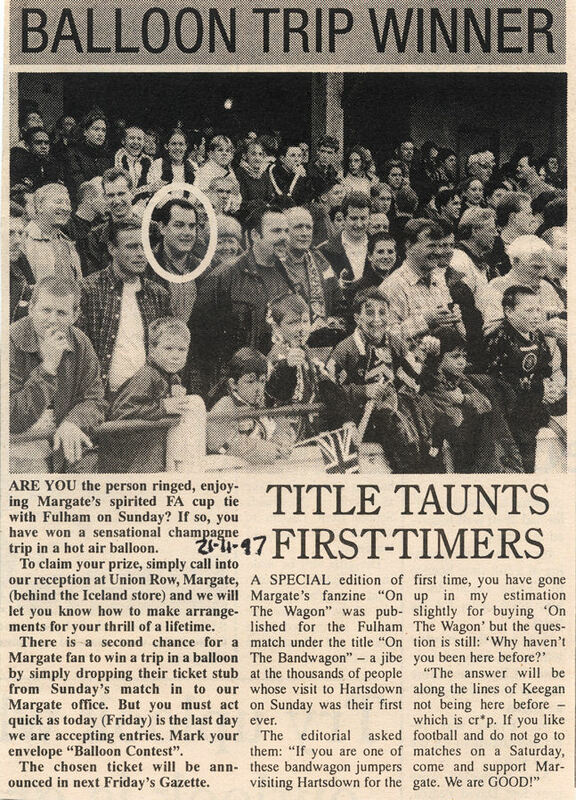 Above: Alan Kay photo showing the moments before kick-off. 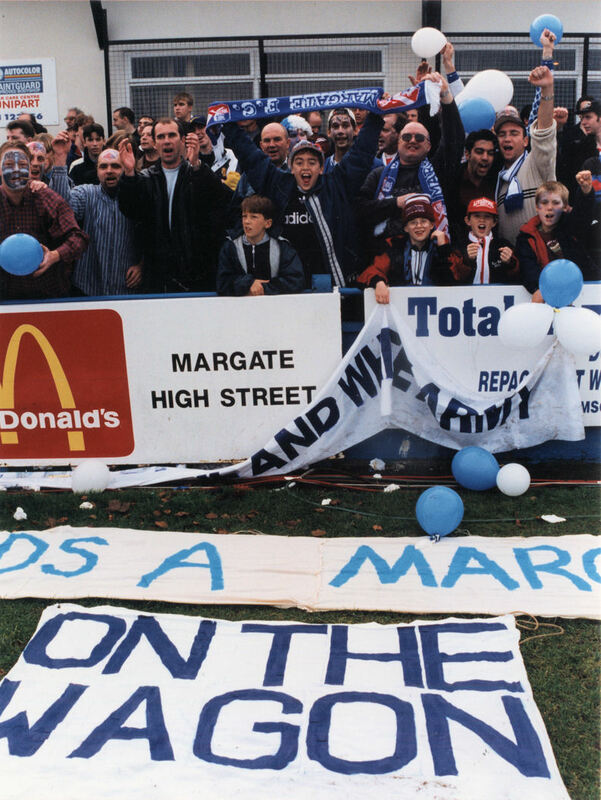 PHOTOS FROM THE MATCH Above: Margate supporters at the Hartsdown Road hail the entrance of the team. 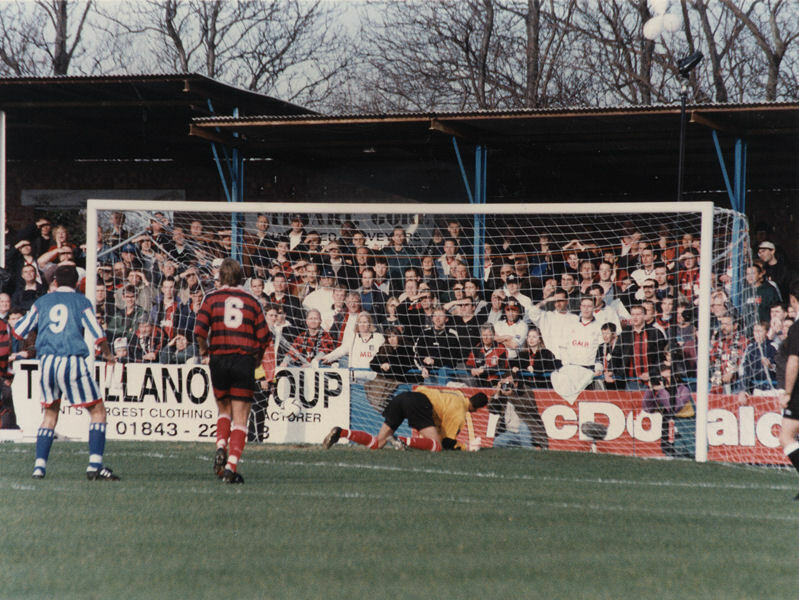 Above: Alan Kay photo showing Mark Munday about to strike his penalty. 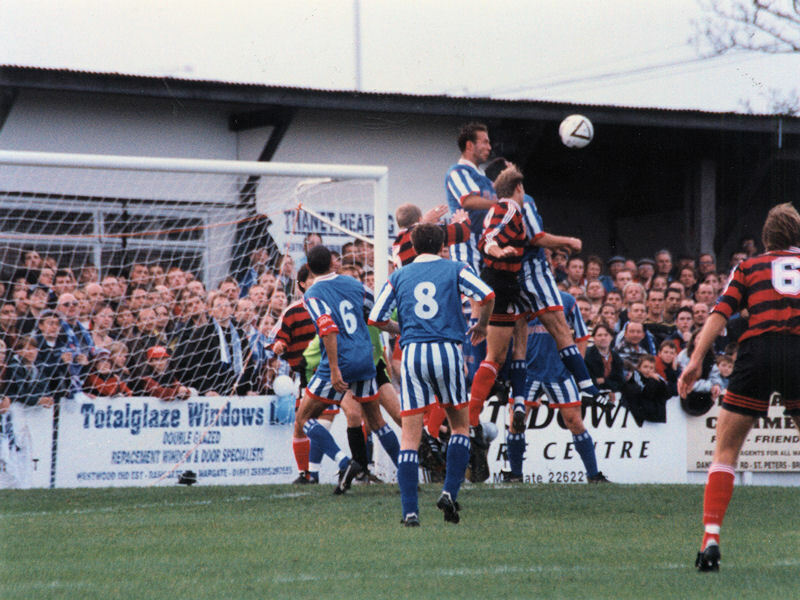 Above: Munday sends the Fulham keeper the wrong way. 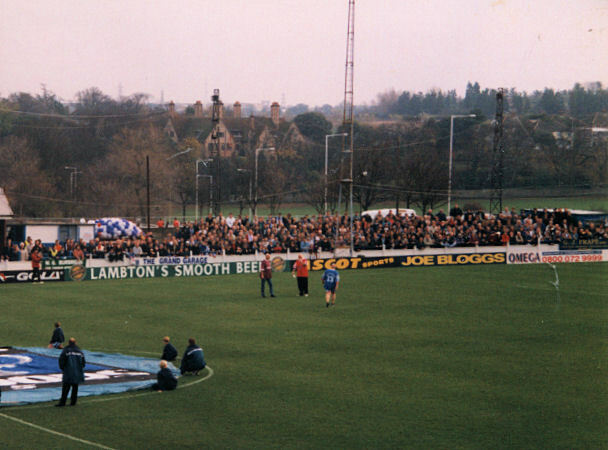 Above: The ball nestles in the corner of the Fulham net. 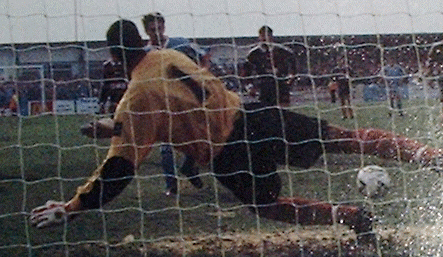 Above: Martin Buglione wheels away in celebration. 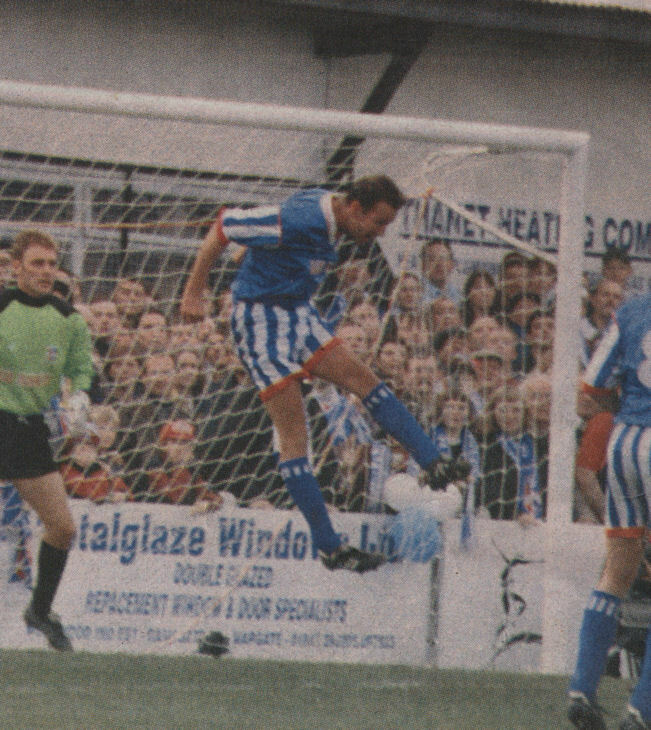 Above: Iain O'Connell climbs highest to head clear. 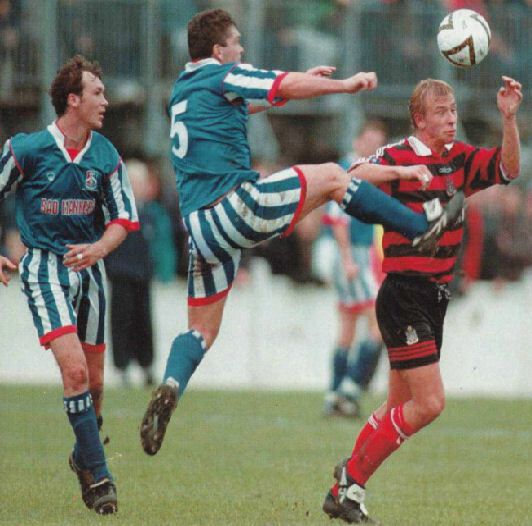 Above: Paul Pilkington and Andy Blondrage (5) battle with Fulham's Richard Carpenter. 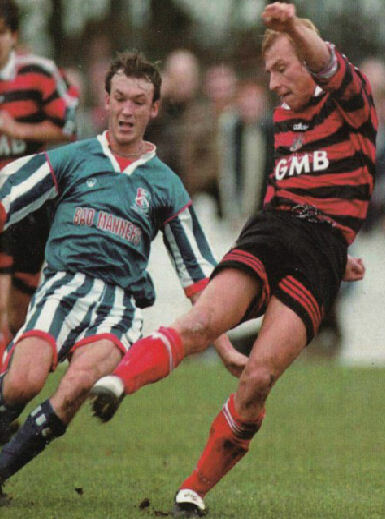 Above: Iain O'Connell challenges Robbie Herrera. 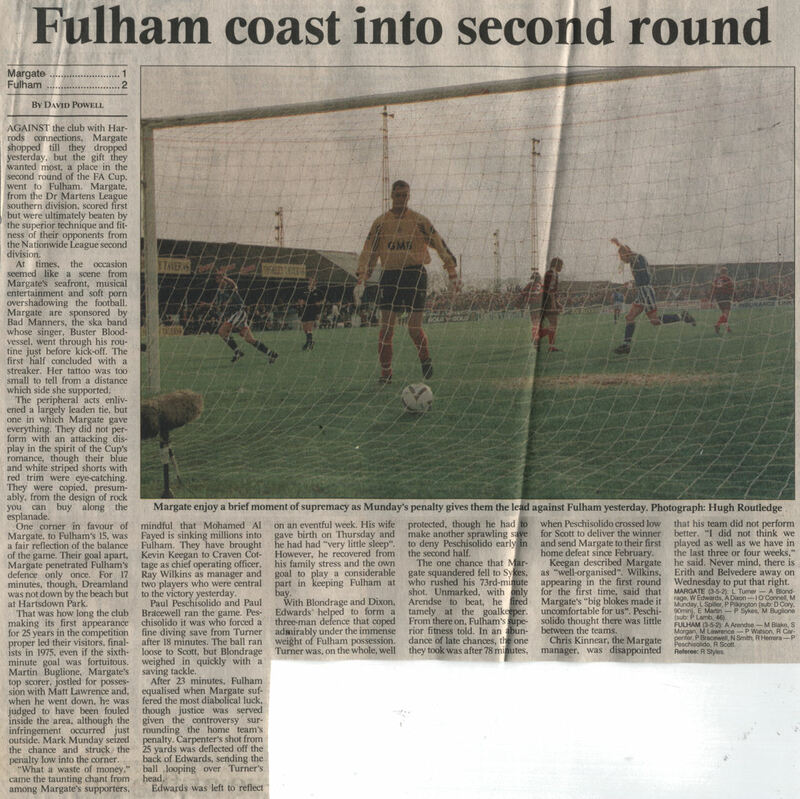 Above: Richard Carpenter strikes the shot that looped horribly off Bill Edwards and into the net for Fulham's equaliser. 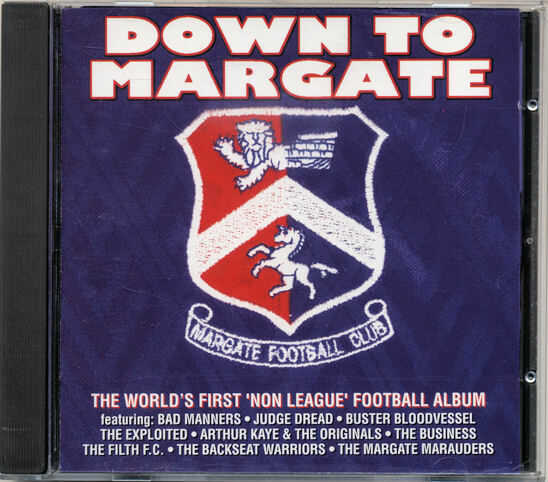 Paul Pilkington is the Margate player. 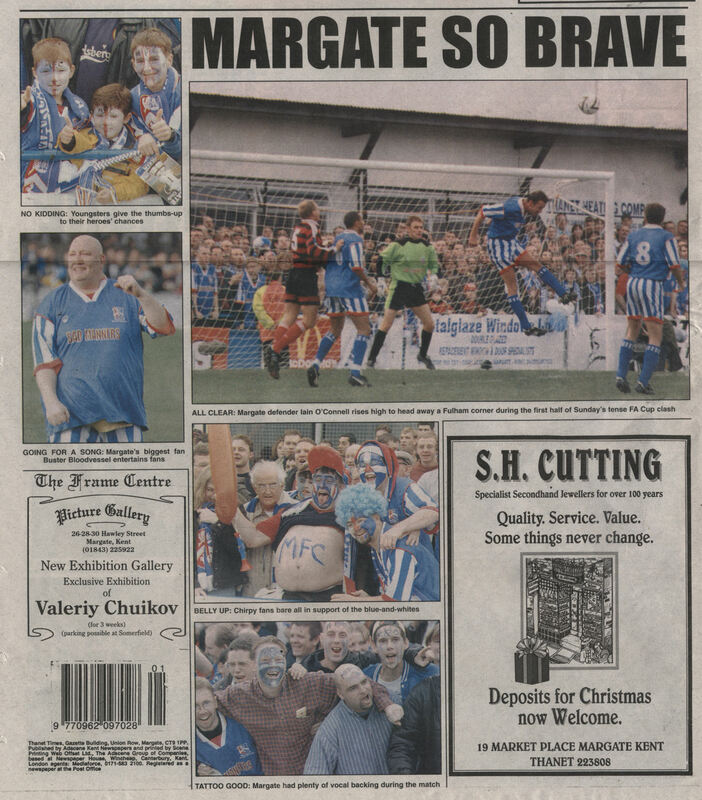 Above: A slightly worse for wear Margate supporter is lead away to be treated by St.John's Ambulance staff. 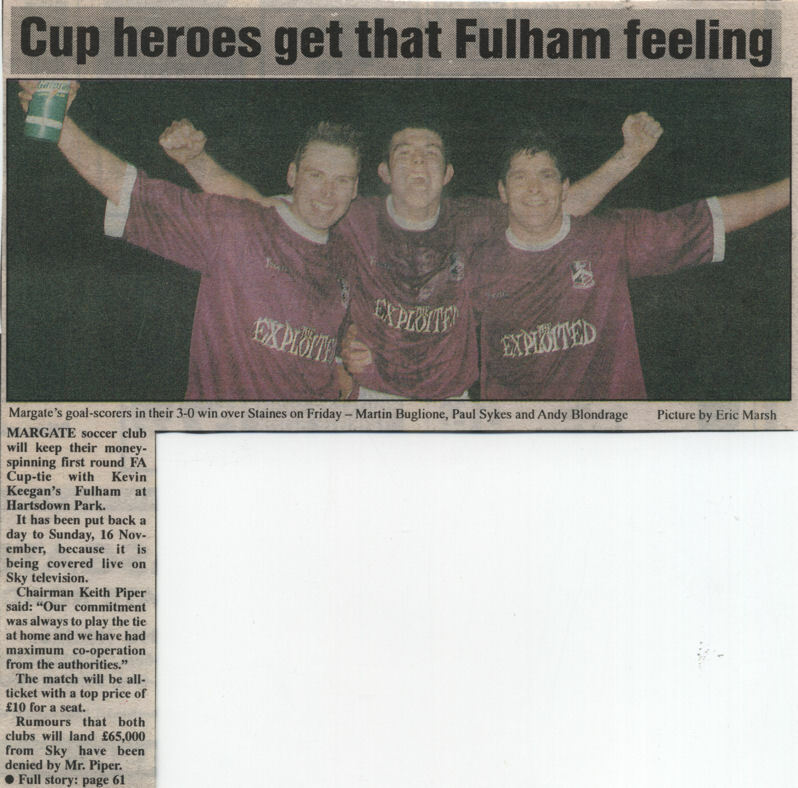 Above: Mark Munday and Fulham's Matt Lawrence. 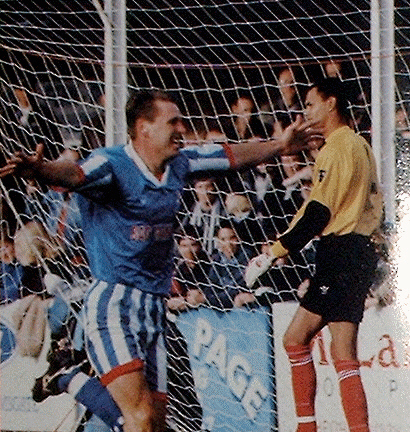 Above: Iain O'Connell rises again. 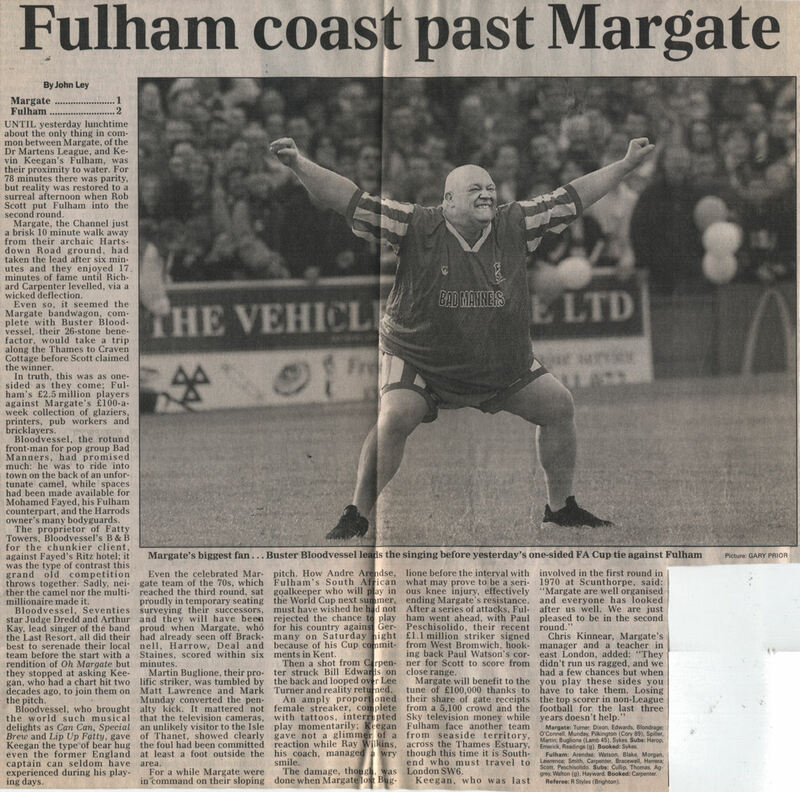 Above: Action shot from an unusual angle as Fulham attack. 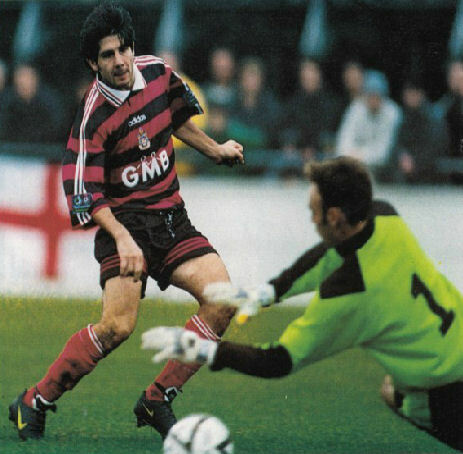 Above: Lee Turner denies Fulham's Paul Peschisolido. 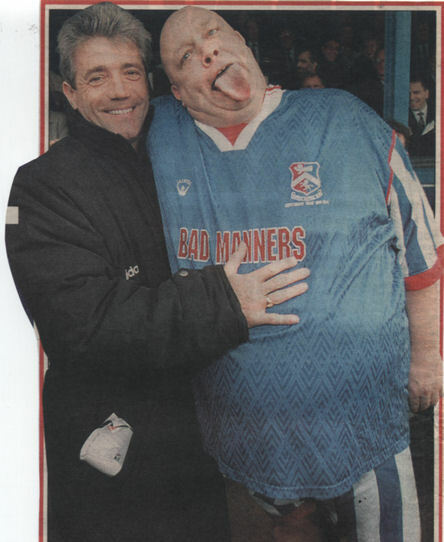 Above: Streaker Becky Drewett is about to greet Mark Munday. 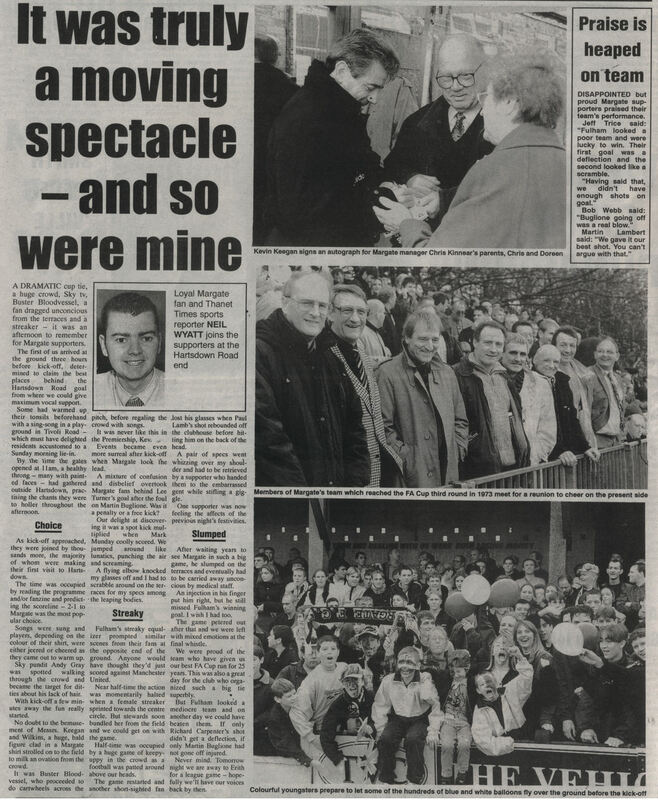 Above: Three photos showing Becky Drewett attempting to avoid capture before being led away. 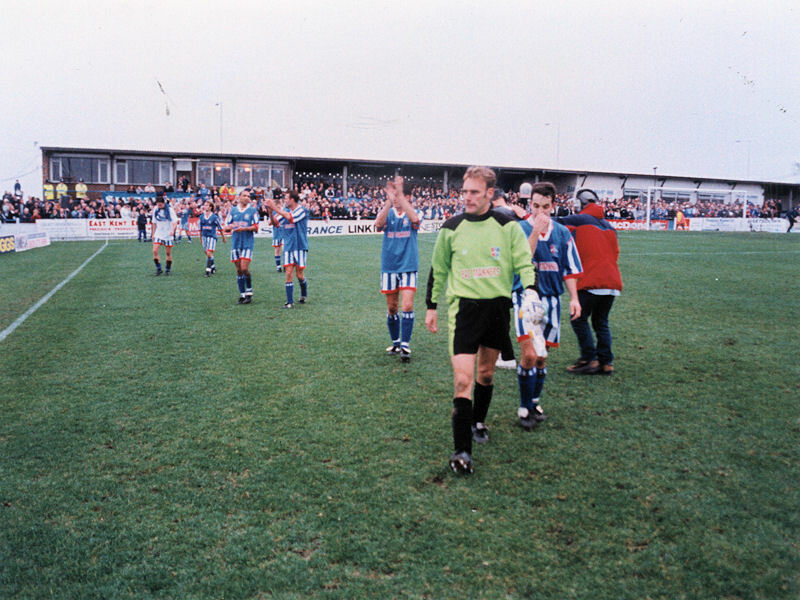 Above: Margate's players leave the pitch at the end of the game led by goalkeeper Lee Turner and Eliot Martin. 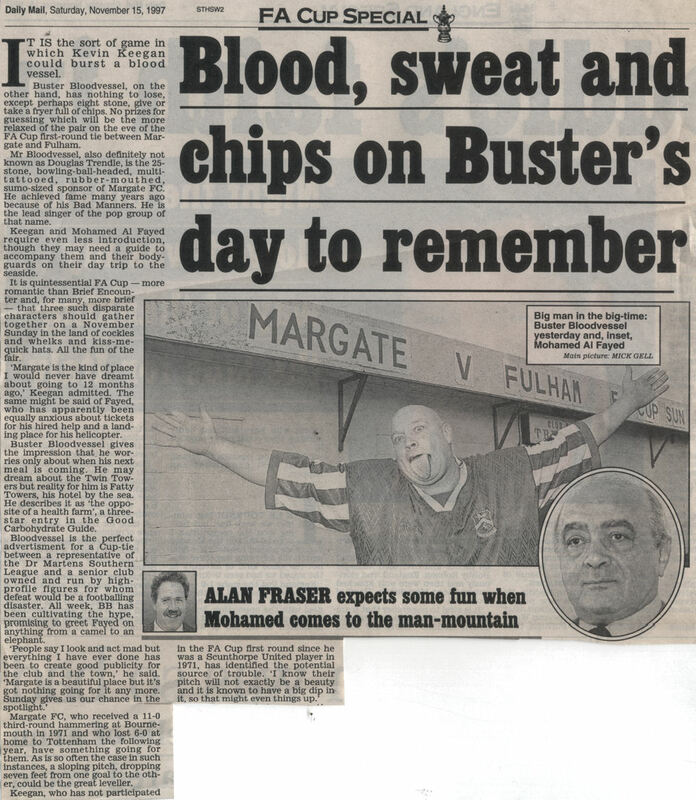 MATCH REPORTS Above: Daily Star report. 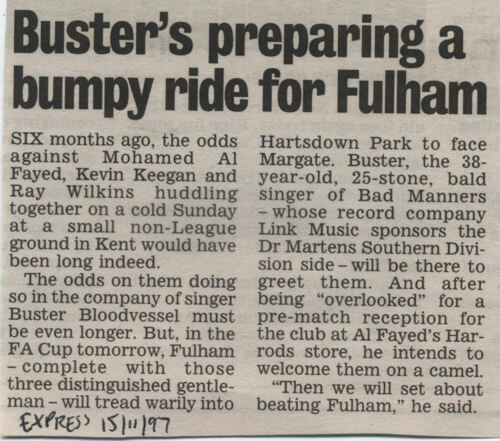 Above: Daily Express report. 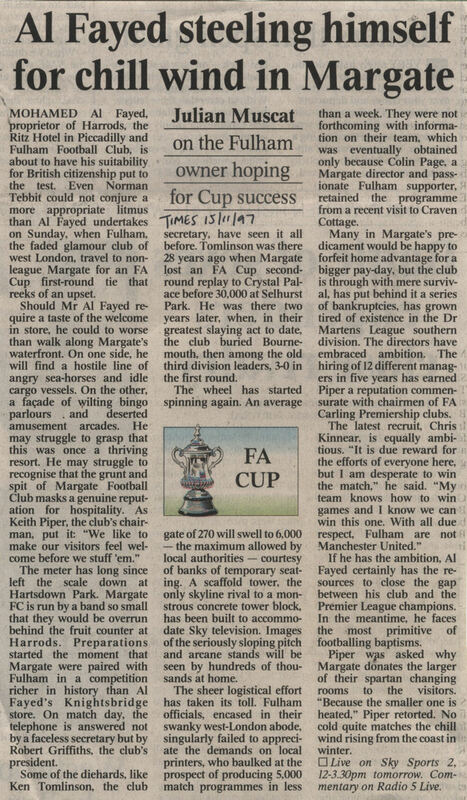 Above: The Guardian report. 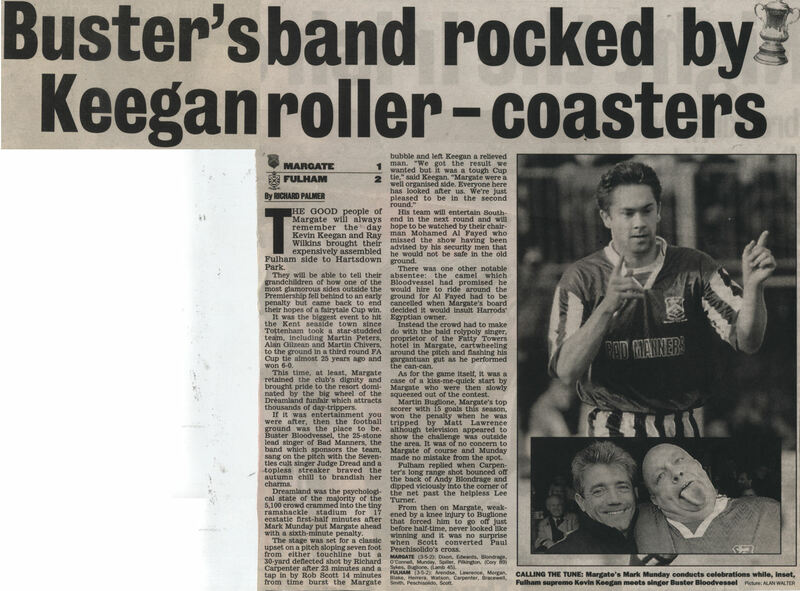 Above: The Independent report. 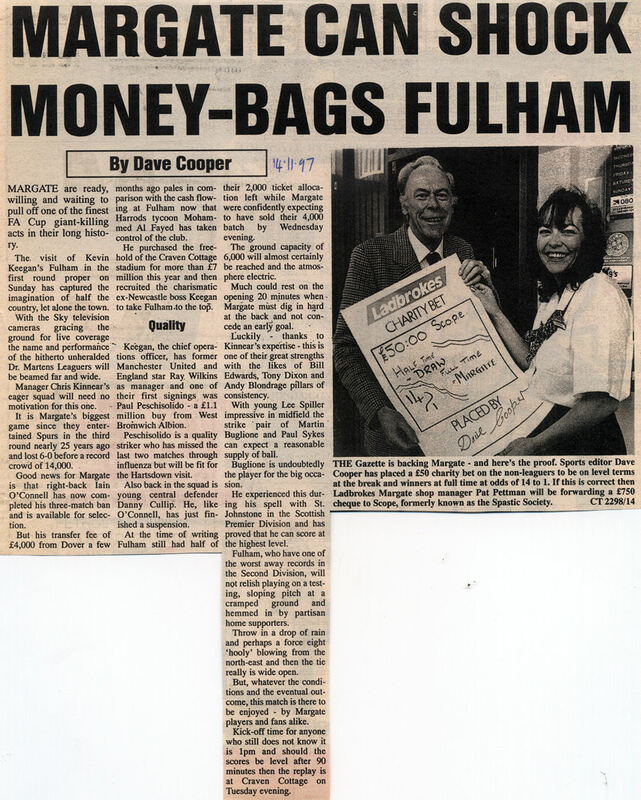 Above: Daily Mail report. 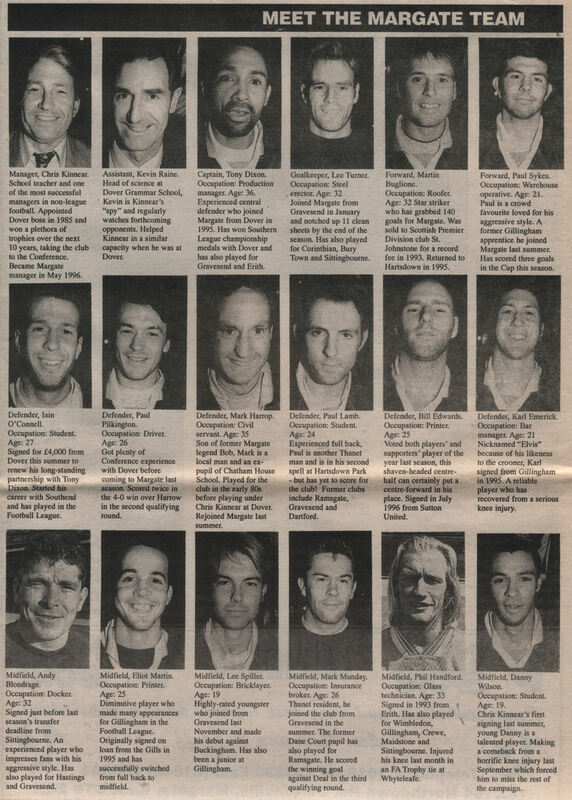 Above: Mirror report. 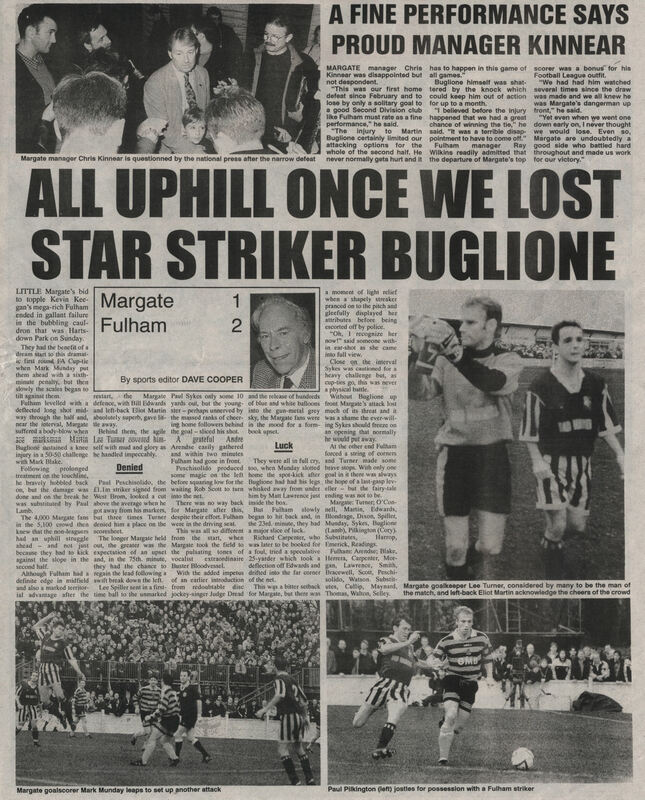 Above: Daily Sport report. 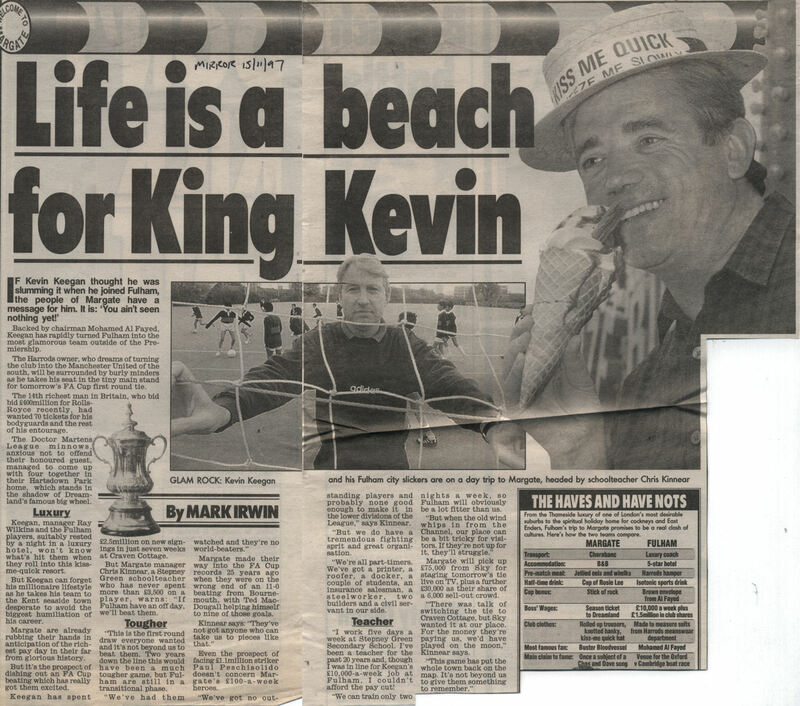 Above: The Sun report. 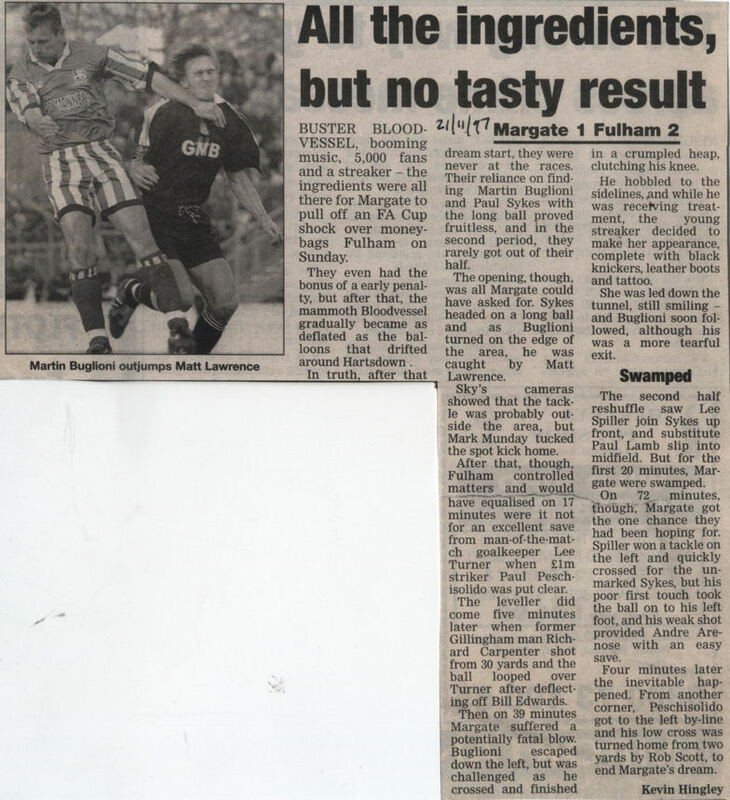 Above: Daily Telegraph report. 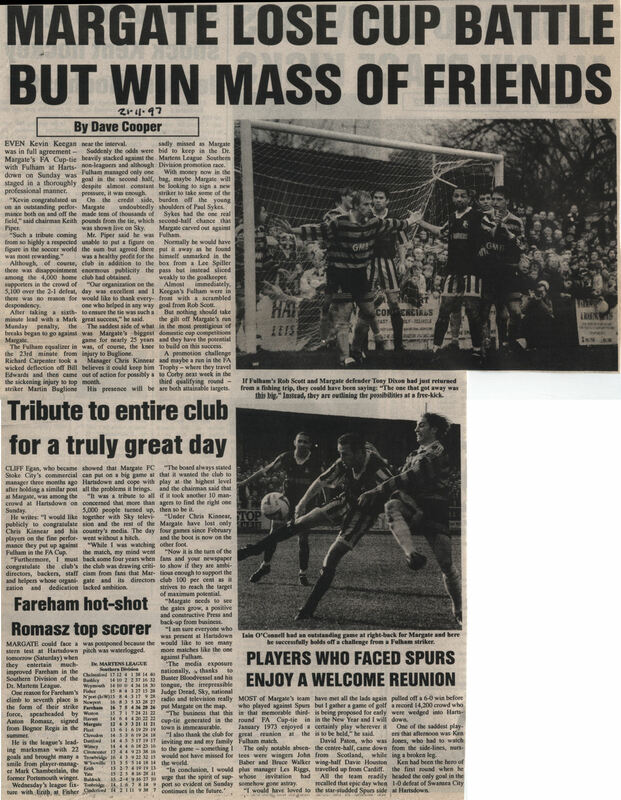 Above: The Times report. 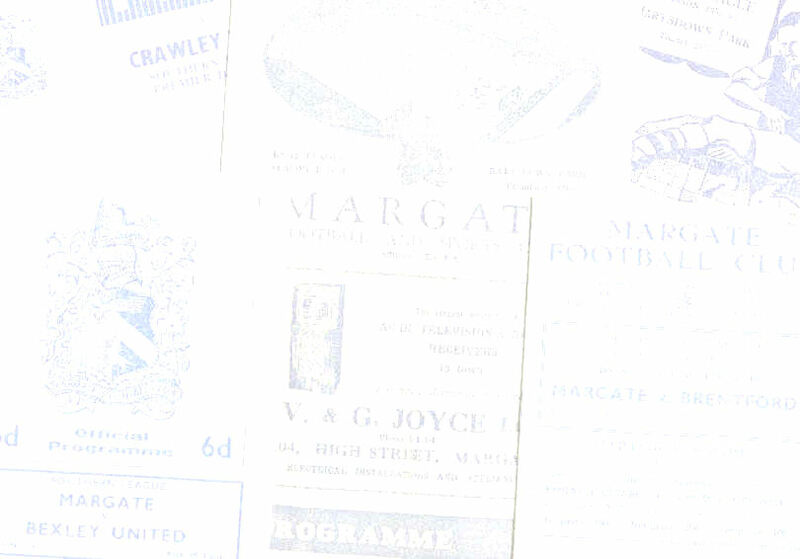 Above: Four pages from the Thanet Times dated 18.11.97. 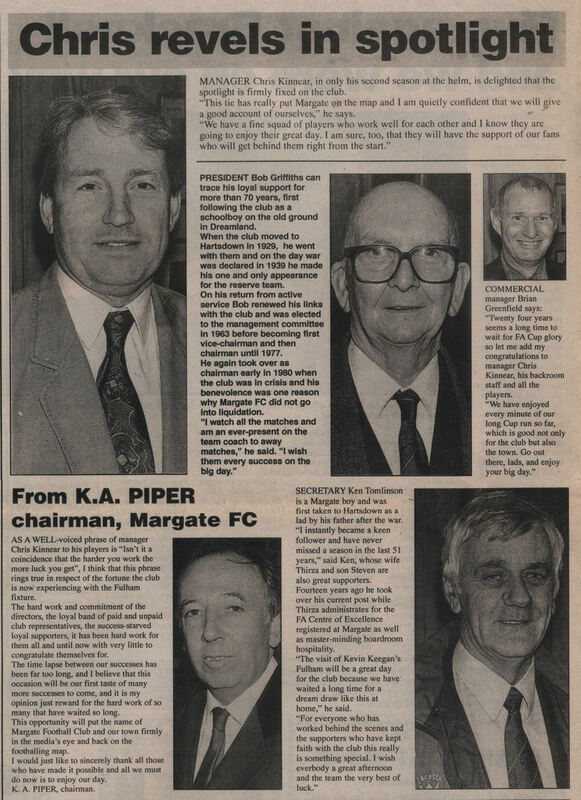 Above: Thanet Extra report. 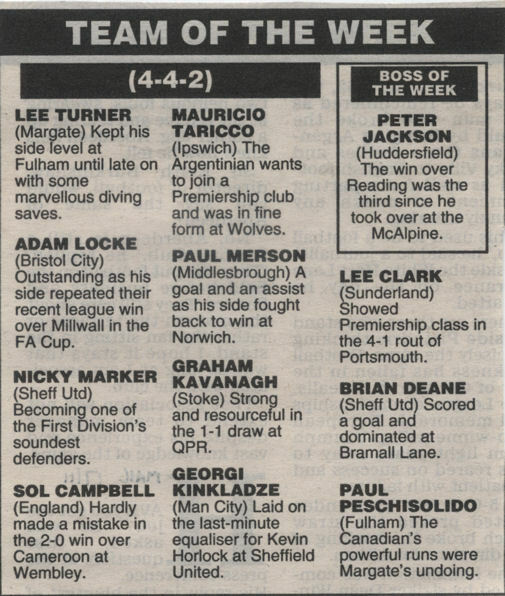 POST-MATCH ARTICLES Above: Lee Turner named in the Daily Mail's 'Team of the Week'.